Has a Dog Impacted your Life? Back story: Lance was born in November 1991. During the holiday season that December, he was thrown outside by his owners and chained, without food, water or shelter. A neighbor took it upon herself to provide him with a dog house and food, but he remained stuck outside on his owners’ property. Lance spent the next ten Christmases the way he spent every other day of that entire decade — outside. My wife and I rescued him in July 2002. The attached photo shows Lance enjoying Christmas inside a home for the first time in a decade. Now if that isn’t a rags to riches story, I don’t know what is. P.S. We spent a small fortune on dog toys for Lance’s first Christmas with us. He had little interest in any of them. 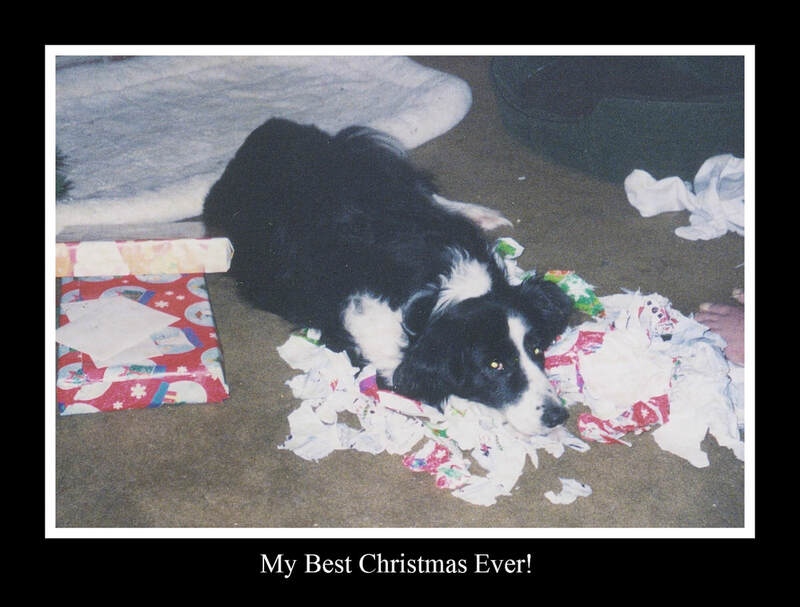 What he did have interest in was tearing up balls of wrapping paper.As you can see from the above photo, he was having a great Christmas. What makes a dog extra special? ​When I was a child, my pet dog Rex, a German Shepherd, was invaluable to me. I didn't have the greatest childhood and Rex was my most consistent pal and confidant. Many years later, Lance, a Border Collie, has had a significant impact on my adulthood. For decades I have been an underachiever and procrastinator, leaving many creative projects undone and discarded. Thanks in part to Lance, I forced myself to write and publish a book. Also, thanks totally Lance, I have been doing my small part to combat domestic animal abuse and help rescue/foster/ adopt programs (You know that old 60’s slogan: “If you’re not part of the solution, you’re part of the problem.”) Lance also has given me the opportunity (I assume unknowingly) to straighten out some personal issues that have "dogged" me for a long, long time. I was just wondering if you might have had or currently have a dog that, besides being a great companion, has impacted your life in some way that is particularly meaningful to you? If so, please let me know in the comments section. A few summers ago, during an afternoon when the temperatures were hovering in the low 90s, I was walking to a parking lot behind the YMCA, where I had just finished a workout. Before I got to my car, I was confronted by two men, one holding a baseball bat. They pointed to an SUV and, accusingly, asked me if it was my car. I told them it wasn’t and asked what the problem was. One of the men said, “Look for yourself.” Inside the car, with its windows totally rolled up, I saw a Boxer. He was alert and active, but drooling profusely, probably dehydrating from the effects of the heat. One of the men had asked the staff at the Y to make a general announcement regarding the situation, with no results. I asked if either of them had asked at the nearby Dunkin Doughnuts, which was mobbed. Neither had, so I hustled over there but had no success. I then called 911 and was told that a police officer was already on the way. I went back to the two men and suggested they let the police break into the car legally. I got into my car and, as I was heading out of the parking lot, saw not one but two police cars coming to the rescue. One lucky dog. Hopefully his owners learned their lesson. DALLAS – The news was on, and it was an all-too-familiar story for North Texas in the summertime. A father had accidentally left his baby daughter in the back of a van, only to find her lifeless body hours later. Bishop Curry V, 11, was watching the news that night with his family. The baby who died was from his small town, Melissa, Texas, and she was about the same age as Curry's baby sister. His mother, Tia Curry, told Fox New what happened next. "He said, ‘Well, somebody has to do something about this...’ and I told him: ‘Why don't you go do something about it?’"
What could an 11-year-old do? Turns out, plenty. But Bishop is no ordinary 11-year-old. His father is an engineer, his mom is a teacher, and Bishop, from an early age, showed an interest in creating things. He carries a journal with him to jot down ideas. That night, about a year ago, he sketched out a car seat and started thinking. After the sketch, Curry worked with his dad to build a prototype, and another, and then two more. He ended up creating a device to prevent hot car deaths. Once the device detects movement, from a baby or pet locked in, a fan kicks on to help lower the rising temperatures and it sends out a notification to police and the parents. "It basically senses the baby," Bishop said. "It cools down the baby and contacts authorities." Bishop now has a patent pending and is talking with car companies and manufacturers. "It blew my mind," said his mom. An average of 37 children die each year after being left alone in a hot car, according to one Northern California researcher. Texas leads the nation in hot car deaths and most of the victims here and nationwide are under 2 years old. Children's Health Dallas is part of a group of organizations trying to bring attention to the issue. Lori Vinson, a registered nurse who is senior director of trauma at Children's Health said heat is particularly dangerous for children. "They don't sweat like we do, so they don't release the heat in the same way we do," Vinson said. "Their respiratory system will be compromised. Then, they actually get into cardiac problems with irregular heartbeats and that can get them into a fatal situation." It will take time before Curry's device, called "Oasis" goes on the market. In the meantime, experts say there is a low-tech option everyone with a young child should try. By leaving a physical reminder in the back seat – a cell phone, a purse or even a shoe since you can't go far without it – a life could be saved. Saving lives is also what would convince Bishop Curry that his device is a success. "Our mission is to save at least one life," Curry told Fox News. "If I can get just one that has been saved, that basically tells me it works." 1--If you're going to be away from your car for any significant time, probably best to leave your dog at home or in the care of others. 2--If you'll be away from car for short time(10 minutes or less) leave car running with air conditioner on and doors locked or, at least, keep windows open enough to circulate air but not to the point dog might be able to exit. 3--leave a bowl of water inside car. 4--Use a sunshade to lessen heat. 5--If possible, park in a shaded area. 5--I'm not going any further. Why ever leave your dog unattended in a car when the weather can be deadly ? Can it can be done without any risk? What are your thoughts? Just viewed Dogs on the Inside. If you haven't seen it yet, I strongly recommend you do. 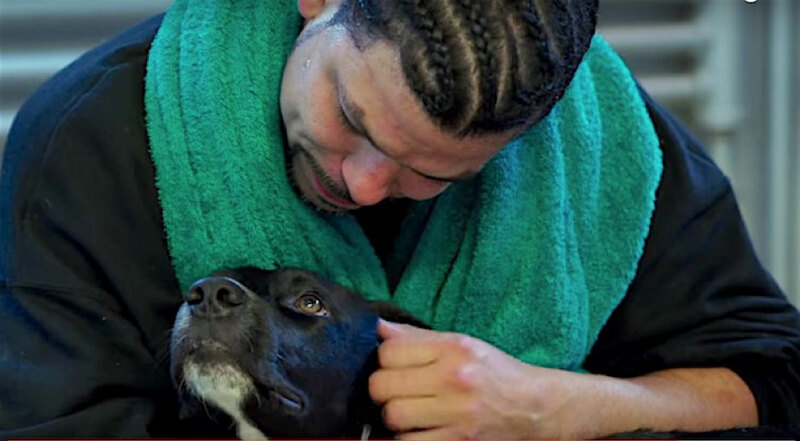 This documentary follows the steps taken in a program called Don’t Throw Us Away, designed to match recently rescued dogs with convicts behind bars. In the process, the canines and prisoners do each other a world of good. Throughout the video, you get to see a whole lot of two-legged and four-legged creatures helping each other make progress in their lives. The dynamics of the program? Inmates, living in a restricted and mostly negative environment, get to have some power and control over how they conduct their daily life, interacting in a positive way with another living creature, the dog they are fostering. Man and beast share a cell (It occurred to me that most likely only the humans felt imprisoned. Dogs adapt better to their living situation, as long as a caring human is nearby. Besides, for these dogs, jail was a step up from where they had been).Do the canines have a positive impact on their convicted caretakers? For me, the sight of a convict allowing himself to be filmed kissing a dog answers that question. Meanwhile, the dogs, many rescued from horrendous situations, regain (or gain for the first time) faith in humans. When ultimately put up for adoption, these dogs are more likely to be part of a success story and less likely to be returned by the adopter. It's the classic win/win situation. One non-spoiler alert—Surprise! Surprise! A stray Border Collie mix named Byram had picked out and walked up to the house of a lady that already had dogs. Guess he sensed she was dog-friendly. That decision led to his rescue. Those Border Collies and their analytical minds! Sadly, one rescuer admitted that a small percentage of dogs are not suitable for this program (Lance, of Lance: A Spirit Unbroken, immediately came to mind). The message: Dogs should be rescued sooner, rather than later, before too much damage has been done to them. As a drug and alcohol counselor in a correctional facility, this documentary really hit home. So many times an inmate will tell me, “Jail isn’t doing anything for me. It isn’t helping me.” While recovery has to be a self-generated internal process, everybody, in or out of jail, can always benefit from positive people, places and things in their surroundings. Why not make a tough job—self-improvement—a bit easier? I can’t help but believe that programs like Dogs on the Inside have demonstrated what can happen when, instead of saying “This is how we have always done things” or “That wouldn’t work”, we think outside the box. Dogs have so much to offer; why waste it? If you have seen Dogs on the Inside, how did you react to it? If you plan to view it soon, please come back to Lance’s Dog Patch and post your thoughts. By the way, do you have any dog-themed videos, films or documentaries you’d recommend to us? Blog Mission: My mission for this blog is to provide a combination of dog-themed humor, dog health care and safety tips, and to facilitate dog rescues. Lance’s Dog Patch will be a source of entertainment and information for you to contribute to and provide to others when you see something here you find worth sharing. Of course, feel free to honor us with your own favorite dog stories, photos, and info. Please invite your friends and family to visit us. Note: no gruesome videos or photos will appear on this blog. A portion of each Lance: A Spirit Unknown book sold goes to dog shelter/rescue operations I have personally vetted. I've put together a dog-themed PowerPoint presentation that is part humorous, part educational to show wherever I can get my foot in the door. This blog. I believe we can entertain ourselves while at the same time we learn more about our canine companions and also make a dent in the all-too-prevalent dog neglect and abuse that exists in our society. Thanks so much for visiting Lance's Dog Patch today. Lance and I look forward to providing you entertainment and information on a regular basis. What is it about canines that make 7 out of every 10 humans in this country describe themselves as"dog people?" How about you? Can you explain why you love dogs?